This Treadmill buying guide aims to provide information on the latest treadmill technology and help you through the process of upgrading or buying your first treadmill. The guide will look at the features to expect and look out for in both home treadmills and commercial treadmills. We have also included some of our top tips for people considering buying refurbished treadmills. Based on the latest gym usage statistics, Treadmills are currently the most popular cardiovascular machines available on the market, primarily because they are easy to use and are so versatile. They can be used for a light walking session to training for a gruelling marathon, and can be used whatever the weather! To save on space, many home treadmills can also fold up for easy storage. In a commercial environment, having a sufficient number of quality treadmills is absolutely essential as Gymetrix studies have shown that treadmill usage in gyms is on average 1.9 times higher than that of Cross Trainers. There are many reasons for treadmills consistently ranking as the "go-to" piece of cardio equipment. People enjoy using them as they get their heart rate up quicker than most other machines and offer a safe alternative environment for running training in winter months whether this is in a gym or at home. 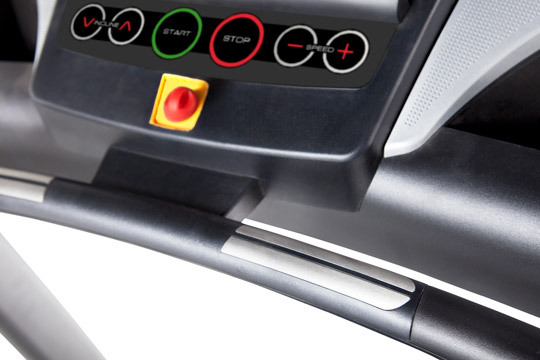 A manual treadmill uses the momentum of the user while running or walking to push the belt around the rollers. There is no motor to drive the belt, so it can be difficult to get the belt moving initially and this can really put stress on your knee and ankle joints. A motorised treadmill will generally give the user a much better experience than a manual treadmill. With the inclusion of a motor to drive the belt, the user can easily change the speed they want to run or walk at with the touch of a button. Most modern treadmills have pre-set programmes that will be used to automatically change the motor speed, making for a more challenging workout. A self-powered curved treadmill uses absolutely no electricity and is powered entirely by the user. Because of the curved rubber track, which glide over ball bearings, this provides a very smooth running and walking experience. A curved treadmill also works more muscle groups in the leg compared to a flat bed treadmill and provides a more natural running experience without sacrificing proper running mechanics. Since there is no motor in a curved treadmill there is no top-speed making it a fantastic machine for indoor high intensity sprints or circuit training. However, many users have also found it ideal for marathon training in the winter, as the curved bed replicates actual running motions much better than a flat bed treadmill ever could. We have created a product video for the SpeedFit curved treadmill which will walk you through all the advantages a curved treadmill can offer. Before embarking on your search for the perfect treadmill to meet your needs, it’s key to know what sort of price range you are looking at. Realistically, if you are considering buying a treadmill for home use, you shouldn't expect to spend less than £500. Admittedly, some motorised treadmills are available from online retailers for as little as £200, but products at the cheaper end of the market are usually less robust and reliable as a higher quality entry level treadmill. 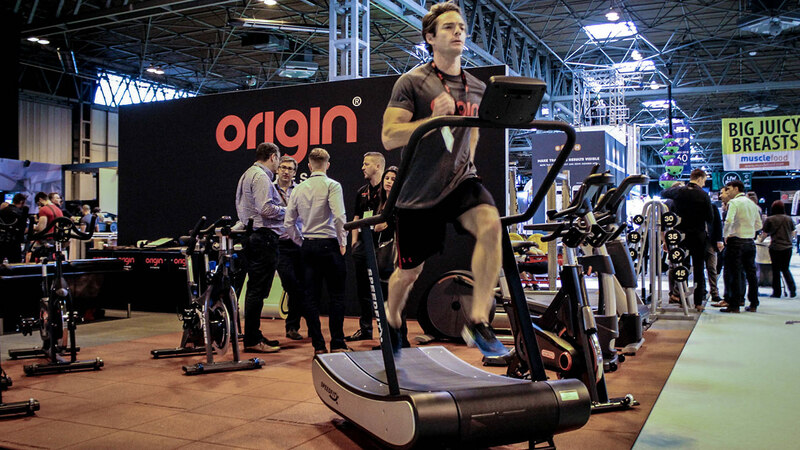 Top-end home treadmills can cost up to £4,000, but these are high performance and robust running machines which often come with a light commercial warranty and a vast range of added extras including heart rate monitor integration and internet connectivity. Refurbished commercial models fall within a similar price bracket upwards for example; a used Star Trac or Cybex commercial treadmill might cost between £1500 and £3000. Finally, new commercial treadmills generally cost anything between £4,000 and £10,000. However, some of the latest commercial models from the industry’s leading brands can command retail prices of over £10,000, especially when some models include integrated 20” HD screens and the most up-to-date connectivity. The average home treadmill isn't likely to be used for more than an hour each day, whereas the commercial treadmills found in modern gyms can see as much as 10 times this level of usage, 7 days a week, which is why the difference in price is so dramatic. 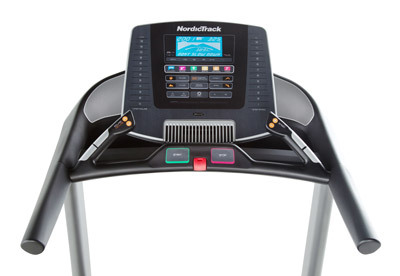 What are the most important Treadmill features to consider? One of the characteristics which separates home and commercial treadmills is that many home treadmills are built to fold away to make storage easier. It is a very important feature to consider if you are buying a treadmill for home use because space is usually limited. When you are not using the treadmill, you will have the option of storing the machine in the corner of the room or in a large cupboard. 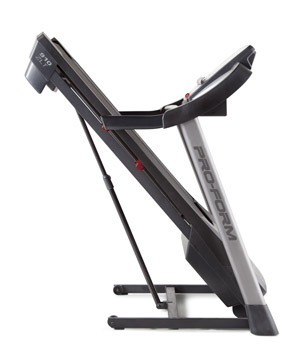 When folded the typical height of a home treadmill will be about 1.70m to 1.80m. However, this does mean that the treadmill is taller when folded, so you should check that it’s not so high that the height of your ceiling becomes a problem. It’s worth double checking that the treadmill you’re looking at has wheels to make transportation easier, although almost all home and commercial models will have these. Elevation is used to create resistance and offers an alternative method of increasing the intensity of your workout to speed. Most treadmills have a maximum level of elevation of 10-15% but some commercial models go up to 20%. A common misconception is that treadmills with higher levels of elevation are for advanced users. Greater variation in elevation actually offers less advanced users, who are often only capable of walking the chance to challenge themselves without making them increase speed to a level that they aren't confident at. The speed capability of the treadmill motor is an important consideration to look at when researching products. A good treadmill’s speed range will allow the user to run or walk at speeds suited to either a serious track athlete or an ultra-marathon runner with ease. Speed settings on the majority of treadmills increase in 0.1 kilometers per hour increments however a useful feature that many modern products is a speed hotkey or direct speed button. This allows you to increase from 0 – 10 kph with just one touch of a button as opposed to pressing and holding the ‘up’ key (or pressing it 100 times). The motor horsepower rating is probably the most important specification to understand when looking to buy a treadmill because it is generally considered a straightforward indicator of the build quality and strength, just the same as engine size is a powerful indicator for car buyers. There are three terms often used to describe motor horsepower; ‘treadmill duty’, ‘peak duty’ and ‘continuous duty’. The figure you want to look for during your research is ‘continuous duty’, as this gives the most accurate representation of a motor’s power. Treadmill duty measures the power output for an average user, running at an average speed for an average length of time so is therefore an average measurement of power. Peak duty refers to the motor’s maximum power output but is measured with minimal load and is only sustainable for a short period of time meaning it’s not an accurate representation of the motor’s capabilities. The Continuous Duty Horsepower rating (CHP) is recognised commercially as the most accurate as the figure, as it relates to the minimum performance across all points of a workout. Continuous duty motors are the most powerful, reliable and long lasting. It’s also important to consider the RPM of the motor as this is relevant to assessing how powerful the treadmill is. Essentially, the lower the motor’s RPM, the greater its ability to turn the belt so if a motor has a CHP output of 3.5, but is running at 7000 rpm the motor is working too hard to be sustained over the treadmill’s lifetime. In short, low RPM and high CHP is the perfect combination. Most models are now fitted with either a LCD or LED console. Apart from the top of the range commercial models which can be purchased with fitted HD screens such as the Cybex E3 Entertainment System, most treadmill displays offer the same information; calories burned, time, distance, speed and heart rate are amongst the most common display fields but designs vary between manufacturers and models. 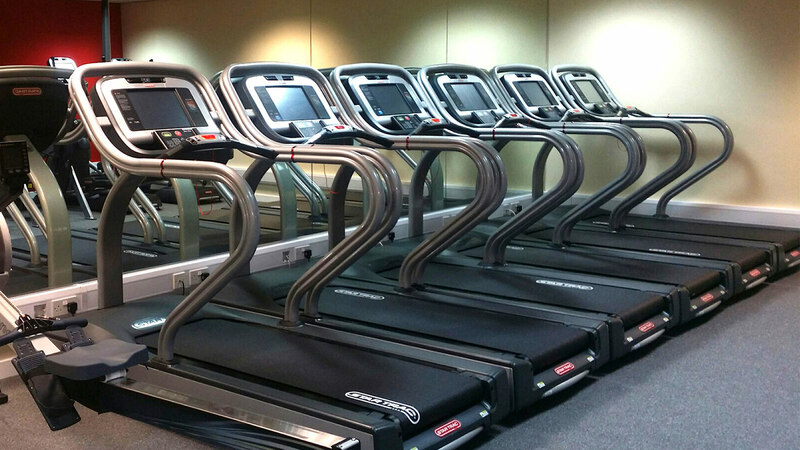 The range of pre-set workouts and installed programs available on both home and commercial treadmills is extensive. The majority of models on the market now focus on pre-set workouts with varying intensities geared towards fat loss or endurance which are controlled by increasing and decreasing speed and incline. More advanced treadmills can interact with mobile applications, online based tools and also feed off information from a heart rate sensor to make workouts more specific and challenging in real time. For people who are likely to be training often or those whose bodies aren’t used to running on a treadmill, cushioning is an important factor to consider during the purchase process. 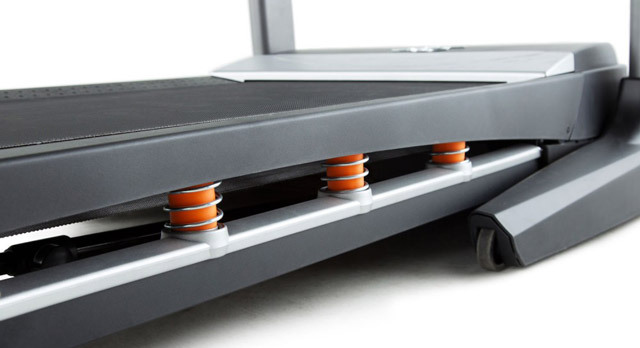 Different treadmill manufacturers will employ different kinds of cushioning technologies however each should provide similar benefits like reducing fatigue and easing pressure on joints. It’s worth being wary though, of any treadmill which feels particularly springy. These poor cushioning systems often just act like a trampoline transferring force back upwards after impact, amplifying any damage that running on the road would have caused. Regardless of the type of cushioning system a treadmill uses the resulting feel it produces will rank somewhere on a scale of very hard deck machines, to very soft deck machines. One is not necessarily better than the other and the level of cushioning best for reducing fatigue and minimising joint pressure lies somewhere in the middle of this spectrum. Generally, commercial models tend to have more solid decks as they need to withstand more vigorous use. Orthopaedic treadmill belts are now also widely available to offer extra support to runners and are often chosen by users who suffer from shin splints as well as joint problems. Cushioned belts from some manufacturers have been claimed to reduce impact at the joints by a further 33%. All models of commercial cross trainers, bikes and treadmills will now come with integrated heart rate sensors in either the grips or handles which inform the main treadmill display on the machine. More advanced products will allow integration with Polar telemetry and/or other brands of heart rate monitoring equipment. One additional feature on treadmills which has become increasingly popular over recent years is cooling fans. These blow air towards the user, giving both a satisfying cooling feeling making their session more comfortable, but also the illusion of the wind you would feel when training outdoors. The open dimensions of a treadmill are important when considering which treadmill is best suited to the space you have available. A similar warning should be taken on board in commercial environments. Just because you managed to fit 6 of a previous model along one wall, doesn’t mean that another product will be the same. Taking the time to measure exact dimensions can save big problems further down the line. It's important to ensure that the belt size suits your stride length, especially for taller individuals who might find their running style unsuitable for some smaller models, especially of folding treadmills. The belt width size doesn’t often cause people difficulty unless they are looking a budget model. Max User weight might be an issue on some of the smaller home treadmill models, however most commercial models will have a weight capacity of at least 180kg, some even allow for up to 220kg (Star Trac E-TRx). On home treadmills this will again, be slightly less, often around 150kg. There is no universal warranty for home or commercial machines, however an example of the warranty offered on one home machine at Origin Fitness is; Lifetime warranty on frame and chassis. 5 years on motor. 2 years on parts and labour. Commercial treadmills may be similar but vary between suppliers, brands and models. Although there is likely to be less financial risk when buying a second hand or refurbished treadmill, the chances of coming across a damaged or faulty model are higher. This means knowing what to ask about and what to look out for is just as important as if you were looking at new models. The first questions you want to ask are about the machine’s history. What sort of environment was it used in before; has it come from a gym, hotel, fitness suite or home? How heavily was it used in this environment and for how long? The age of a treadmill is a reasonable indication of the level of strain which has been put on the frame, motor and electrics over its lifetime. If you are looking at a refurbished treadmill, ask exactly what this refurbishment has included. Some refurbishment work may only consist of repairing cosmetic damage, whereas more extensive refurbishment will involve stripping the whole machine down, examining all of the components and doing any repairs or replacements necessary. So it would be worth asking if there have been any parts been fixed or replaced. Again, it’s important to look at the warranty details for refurbished products as this will likely be different again. One of the most common faults in treadmills is wear to the belt. When a belt becomes worn it might slip between the machine’s rollers and make for an uncomfortable running experience. Over time a treadmill’s motor might lose some of its original power and naturally a 4.0 CHP motor won’t still be giving out that much power after 4 or 5 years of consistent use. To assess the performance of a used or refurbished treadmill the best thing to do is to try it out. A weak motor wouldn’t be that noticeable straight away, but after it has been working a while it may start to be noticeable. To make sure, you should turn it up to both maximum speed and maximum incline and also complete a pre-programmed workout at a wide variety of intensities over at least a 20 minute period. You should also try to check that all the buttons on the console are in working order; both the increase/decrease arrows and emergency stop cord are the most important. Finally, once you've navigated your way through the selection of new, used and refurbished treadmills, ask the company about delivery and installation before you commit to making the purchase. Sometimes if you're buying a refurbished commercial treadmill it will be delivered fully built as it will have been built within the previous site and removed as a whole. The way different couriers and delivery services operate can vary and for commercial buyers, you will almost definitely want an engineer to come and install your machine, a service for which there is often an additional charge. This entry was posted in Buying Guides, Knowledge & Advice on 10th April, 2014 by Colin Evans.